Is there anything chicer than Molton Brown? I find it hard to believe. There's something so unbelievably luxe about every single Molton Brown product out there. 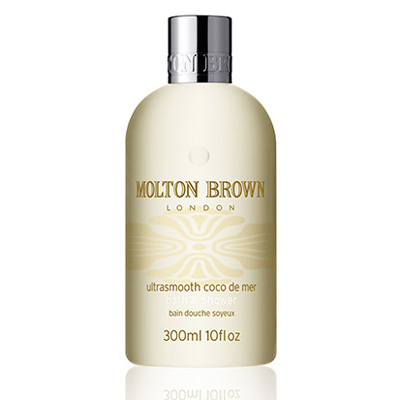 And right now I'm totally loving the Molton Brown Ultrasmooth Coco de Mer Bath & Shower. You know it must be good when the biggest flaw I can find is the fact that they leave the word "gel" off the end of the name. Because let me tell you, this is one amazingly powerful shower gel. It bubbles, it foams, it forms a lather so rich and lush I feel it cannot just be an earthly delight. And this is just with a dime-sized amount poured onto a pouf! It's formulated with coco de mer, otherwise known as sea coconut, which is a giant palm found only in the Seychelles. Its seed takes 10 years to mature and produces an oil that's intensely hydrating and skin-softening. Honey extract also works to moisturize and condition skin. Not to mention the intoxicatingly lovely scent that wafts from the bottle as soon as you pop the cap. It's exotic but understated enough for day -- and it's unisex, so you and your BF can fight over who gets control of it in the morning. Molton Brown Ultrasmooth Coco de Mer Bath and Shower retails for $30 at moltonbrown.com.